This beautiful cottage house in a 17 acre estate is surrounded by a peaceful Mediterranean landscape, 10 min from the beach. 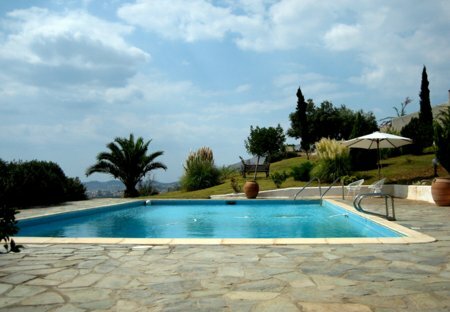 Has private pool & is ideal for families & all lovers of quiet countryside. 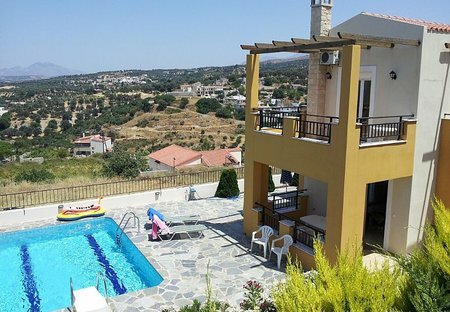 Maripaul Villa is an ideal property for families and groups of friends with up to 8 members, seeking a relaxing holiday near the sea. Chic and contemporary villa with undisturbed sea views, located 200 from the coast and 4 minutes from the sandy beach, bars and restaurants. Enjoy your own private pool and fully equipped kitchen. Filerimos Oasis combines comfort, luxury and privacy and it is an excellent choice for families and groups of up to 8 people. Secluded, luxury villa, pool and astounding views. Up to 7 Bedrooms, 5 baths, large BBQ area. Quiet pristine coast line. Certified by the Ministry of Tourism of Greece. Villa Georgia is located in Gerani, Crete. This detached vacation rental property is air-conditioned and sleeps up to 6 people with 3 bedrooms, 2 bathrooms along with private swimming pool. Vasiliki Villa is an impressive 3-level structure of 350 m2, which provides luxurious and comfortable accommodation for VIP clients, families, couples or groups of friends.